Propelled by the heart, blood circulates through the body by two distinct routes: through the lungs (where it collects oxygen) and through the rest of the body. 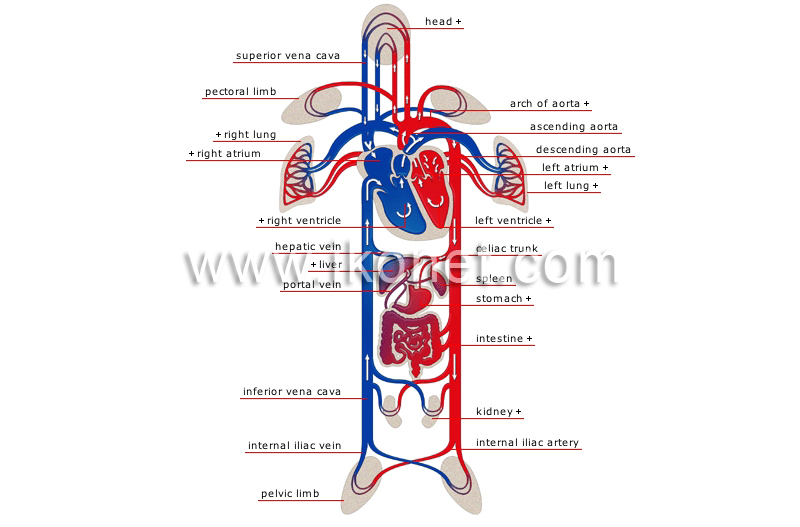 Branch of the aorta supplying blood to the pelvis and lower limbs; it divides into the internal and external iliac arteries. Large branch of the descending aorta dividing into three arteries that flow to various abdominal organs (stomach, gallbladder, liver, pancreas). Large vein carrying blood from the abdominal organs (small intestine, stomach, gallbladder, pancreas and others) to the liver. Vein carrying blood deoxygenated in the lower portion of the body (below the diaphragm) to the right atrium; it is the largest vein in the organism. Vein carrying blood from the lower limb back to the inferior vena cava. Attached to the trunk at the hip, it is made up of the thigh, the leg and the foot; its role is to support the body. Attached to the trunk at the shoulder, it is made up of the arm, the forearm and the hand. Thick-walled heart cavity receiving oxygenated blood from the left atrium; it then forces it into the aorta to circulate throughout the organism. Heart cavity receiving oxygenated blood from the lungs via four pulmonary veins; it then forces it into the left ventricle. Respiratory organ divided into two lobes where blood from the pulmonary artery is cleansed of carbon dioxide and enriched with oxygen. Third segment of the aorta flowing down the thorax to the diaphragm; it then branches into various arteries between the ribs. Second segment of the aorta, which branches into the arteries flowing to the head and upper limbs; with the ascending aorta, it forms the arch of the aorta. First segment of the artery leaving from the left ventricle; it branches into two coronary arteries that flow to the heart. Upper portion of the body containing the main sensory organs and the brain. Vein carrying blood from the liver back to the inferior vena cava. Thin-walled heart cavity receiving deoxygenated blood from the right atrium; it then forces it into the pulmonary artery leading to the lungs. Heart cavity receiving deoxygenated blood from the lower and upper venae cavae; it then forces it into the right ventricle. Respiratory organ divided into three lobes in which blood from the pulmonary artery is cleansed of carbon dioxide and enriched with oxygen. Vein carrying deoxygenated blood from the upper body (above the diaphragm) back to the right atrium.